Iain Finnie, professor emeritus of mechanical engineering at the University of California, Berkeley, and one of the world’s leading experts on the fracture of materials, died on Dec. 19 from pneumonia and complications of Parkinson’s disease. He was 81. Finnie was a leading expert on engineering materials. His 1959 textbook, “Creep of Engineering Materials,” written with William Heller, is regarded as a classic in its field. In the course of his 32-year career at UC Berkeley, Finnie served as faculty advisor to more than 40 doctoral students with whom he wrote more than 185 papers on subjects such as fatigue of metals, crack propagation and erosion of materials. 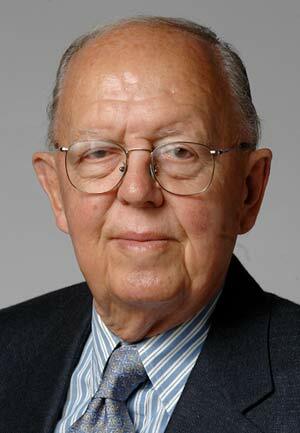 He served as chair of the Department of Mechanical Engineering from 1979 to 1987. He held a strong record for recruiting some of UC Berkeley’s top talent, and for encouraging underrepresented minorities to pursue careers in engineering. Many of the professors he hired have become university presidents, deans and distinguished faculty worldwide. Finnie was born on July 18, 1928, to Scottish parents in Hong Kong, where his father worked as director of a British-owned dockyard. In 1940, Finnie, with his mother and sister, moved to British Columbia when civilian British women and children were ordered to evacuate Hong Kong during World War II. After graduating from high school after only two years, Finnie left Canada to attend Scotland’s University of Glasgow, where he graduated in 1949 with a bachelor of science degree with first class honors. He completed his M.S. and Sc.D. degrees in mechanical engineering at the Massachusetts Institute of Technology (MIT) in 1950 and 1953, respectively. While at MIT, he was trained by such luminaries as Jacob Pieter Den Hartog, a world expert on mechanical vibrations, and Wallodi Weibull, author of what is widely considered the world’s most popular probability model for life data. After graduating from MIT, Finnie moved to Emeryville, Calif., to work for Shell Oil Development Co. In 1961, Finnie joined the faculty at UC Berkeley as an associate professor, and was promoted to full professor just two years later. In 1965, as part of a UC team led by Erich Thomsen, now a UC Berkeley professor emeritus of mechanical engineering, Finnie helped establish the engineering department at Universidad Católica in Santiago, Chile. In 1967, he received a Guggenheim Award, a rarity for engineers, to study brittle solids – research that took him from a South African gold mine to a rock drilling site in Switzerland. In 1974, he received an honorary D.Sc. degree from the University of Glasgow. Finnie was elected to the National Academy of Engineering in 1979, and appointed an honorary member of the American Society of Mechanical Engineers in 1981. When he retired from UC Berkeley in 1993, Finnie received the Berkeley Citation, the highest honor the campus awards. In 1969, Finnie married Joan Roth McCorkindale, a widow with two young daughters, Carrie and Katie. The couple had a daughter, Shauna. All three daughters pursued graduate degrees — including two in mechanical engineering — and each credits her father’s influence for her academic and professional drive. Finnie spent two sabbatical leaves, in 1976 and 1987, in Lausanne, Switzerland, where he was a visiting professor at L’École Polytechnique Fédérale de Lausanne (EPFL). Finnie remained close to his students over the years, sharing his humor, passion for skiing, and hospitality, his colleagues and family recalled. At one of many gatherings at Finnie’s Berkeley home, his graduate students wore T-shirts labeled “Finnie’s Flaws” in honor of their research on fracture mechanics, and gave him a “Master Flaw” t-shirt. Iain is survived by his wife, Joan Finnie, of Berkeley, Calif.; three daughters, Carrie McCorkindale of Fremont, Calif., Katie Croxdale of Edina, Minn., and Shauna McIntyre of Encinitas, Calif.; three grandchildren; and his sister, Jean Mackie of Hong Kong. The family requests that donations in Finnie’s honor be made to the UC Berkeley Foundation, College of Engineering, College Relations, 201 McLaughlin Hall #1722, UC Berkeley, Berkeley, CA 94720-1722. “Iain Finnie Memorial Fund” should be noted on the memo line.